Gov. Larry Hogan endorsed Del. Kathy Szeliga for U.S. Senate Tuesday. Both are skipping the Cleveland GOP convention. Screen shot from video on Szeliga's Facebook page. CLEVELAND -– Gov. Larry Hogan isn’t the only high-profile Maryland Republican to take a rain check on the GOP’s national convention. Instead of traveling to her party’s gathering where Donald Trump claimed the GOP’s presidential nomination Wednesday, Maryland House Minority Whip Kathy Szeliga decided to remain in her own state to focus on her campaign against Rep. Chris Van Hollen of Montgomery County for the open U.S. Senate seat. 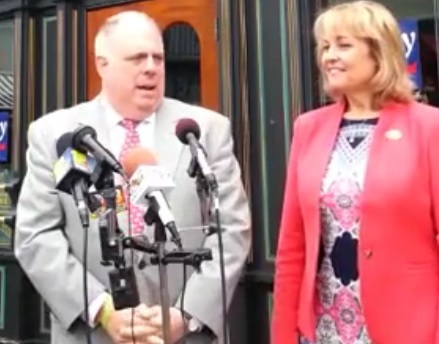 Szeliga joined Hogan Tuesday in Annapolis at a roundtable discussion on helping veterans and picked up the governor’s formal endorsement. Szeliga saidt she couldn’t justify the expenses for such a short trip. This choice, she said, would earn her points among Marylanders for being fiscally conservative, noting that she has significantly less campaign cash than Van Hollen. The Democrat had raised slightly more than $8 million through the second quarter of 2016, compared with her $434,000, according to OpenSecrets.org, a campaign finance website. Although a majority of Maryland Republicans – 54 percent – opted to support Trump in the state’s primary April 26, some of the state’s Republicans have kept their distance from the real estate mogul. Hogan has said he has no plans to vote for Trump and has been critical of him. Szeliga, running in a state that traditionally votes Democratic in presidential elections, has said she will support her party’s nominee, but is concentrating on her own contest. That doesn’t sit well with some Marylanders here. Some delegates, who wished to remain anonymous to avoid antagonizing another party member, privately expressed discontent and disappointment with Szeliga’s and Hogan’s absences in Cleveland at a time when unity is a key goal of their party after a fractious primary season. Since announcing her candidacy in November, Szeliga has said she would support “the presumptive nominee,” but has openly denounced some of Trump’s statements. Representatives from Van Hollen’s campaign criticized Szeliga for any alignment she has with Trump. But he had less sympathy for others who stayed away, although he didn’t mention specific names.